Guided by the program theme of ”Transformation, Future Vision,” the delegates focused on leadership, entrepreneurship, technology, trade, energy and infrastructure and their roles in U.S.-Japan relations. 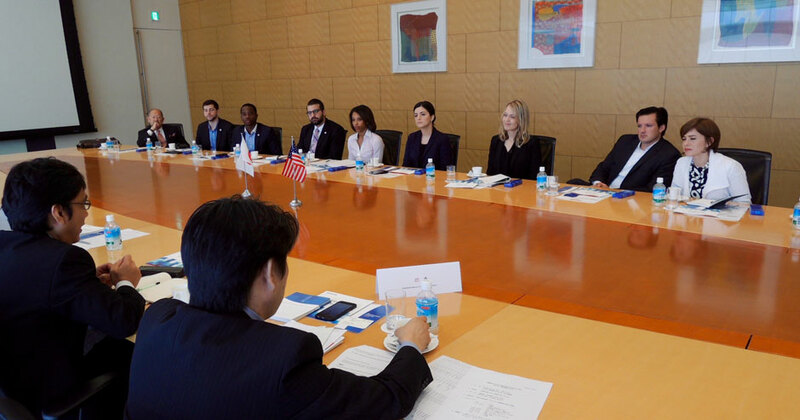 The American delegates traveled to Miyagi Prefecture where they met with government officials and business leaders from Onagawa, Higashi Matsushima and Miyagi. They were given tours of the local areas and learned about the reconstruction efforts and the revitalization projects that are taking place. The delegates also learned about the enormous challenges facing the devastated areas in rebuilding their communities. 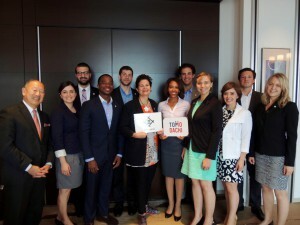 The group also held meetings in Tokyo with Panasonic Company, Fast Retailing, Department of Tourism, Mitsui, MOFA, and other guest speakers and learned about Japan’s focus on the 2020 Olympics. One of the most important part of the program was the engagement of the American delegates in a leadership training program with the Japanese delegates. They were able to explore their goals, future career plans and the next steps in becoming a leader. This is the third year of the program and the alumni remain active participants of the program. Thirteen program alumni from Japan participated in the orientation, reception and group meetings and were able to network and connect with all of this year’s class. Friendships have resulted from the program which last far beyond the planned activities.